März | 2011 | FREE IRAN NOW! In Tunesien, Ägypten , im Jemen und in Bahrain, die Revolutionen, Massendemonstrationen und Proteste hatte man in Teheran noch als islamisches Erwachen in den Fußstapfen der großen Revolution von 1979 bejubelt. Dann tauchte zwar die Grüne Bewegung wieder auf und wollte sie auch feiern, aber für derart dumme Ideen gibt es ja die Bassiji Milizen, die klar machen, wer-wie-wann-was im Iran zu feiern hat. Bashar Assad’s regime is anti-American to the core and is tied at the hip to Iran. It has supported elements of al-Qaeda; preaches radical Islam despite its secular governance; is a major backer of Hamas, Hezbollah and Palestinian Islamic Jihad; and has the blood of countless U.S. soldiers and Iraqis on its hands. The Iraqi government even tried to build support for a UN tribunal to prosecute Syrian officials for destabilizing Iraq in 2009. You’d be hard-pressed to find an uprising more worthy of the West’s support, at least politically. Egypt’s new foreign minister, Nabil al-Arabi, said Tuesday that his country wants to promote ties with Tehran and that Cairo no longer sees Iran as its enemy. In Teheran, wo noch immer eine Straße nach dem Sadat-Attentäter Khaled al-Islambouli benannt ist, wird man über die neuen Töne vom Nil hocherfreut sein. At the moment in history when people are not just rebelling in the Middle East but when the opposition movements in Iran and Syria are at a high point, the fact that the U.S. government is standing by and not only doing nothing but virtually saying nothing. Just when the Green Movement seemed to have been defeated by the brutal repression of the Iranian regime, the mass uprisings in the Arab World gave it new life. 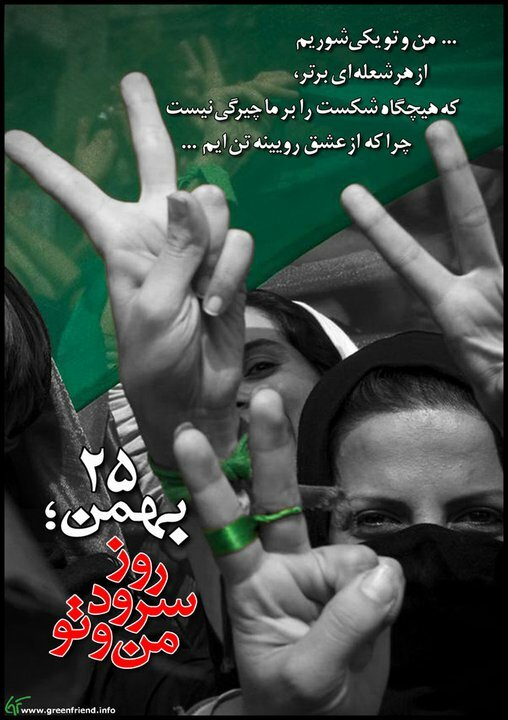 This resurgence of the Green Movement is evident not only in recent street protests in Tehran and other major Iranian cities on February 14, February 20, March 1 and March 8, but also in a variety of articles by activists and thinkers who are reflecting on the lessons of the Middle Eastern uprisings (References are provided at the end of this article). In my reading of many of these articles, I have come across three main issues: 1. The need to raise economic demands alongside political demands; 2. The need to go beyond calling for reform and put revolution on the agenda; 3. Warnings about the internal dangers after a movement successfully overthrows a dictator. On Thursday March 24, 50 prisoners from Qezelhesar Prison in Karaj were transferred to Evin Prison. According to reports, these prisoners were charged with starting a riot in Qezelhesar Prison. It seems that officials have transferred these 50 prisoners, who all have death sentences, for execution in Evin Prison. Notably, in the March 15 clashes in units 2 and 3 in Qezelhesar Prison in protest to the planned execution of 10 prisoners, 150 prisoners were severely wounded especially after prison guards used live bullets and at least 80 prisoners were killed. Sources close to the government have announced that 47 prisoners were killed and injured in this incident which is immensely different from reports from independent sources.